Microsoft Surface Book includes an Intel Core i7 processor, 1 TB of storage, 16 GB RAM, and up to 16 hours of video playback. Improved graphics performance with NVIDIA GeForce GTX 965M 2GB GDDR5 memory. 13.5 inch PixelSense Display works completely with Pen and touch (Surface Pen included). Featuring Windows Ink, a way to naturally capture notes at the speed of thought – with no need to be logged in. Windows Hello is the password-free sign-in that gives you the fastest, most secure way to unlock your device. Most powerful device in its class. Surface Book with Performance Base is built for power with Intel Core processors and 16GB of RAM. A full day of ideation & creation. Up to 16 hours of battery life for video playback keeps you going all day, every day. Meticulously crafted & built to last. Surface Book with Performance Base is developed for power while remaining thin and light enough to take with you anywhere, without losing an ounce of performance. Design & create with Surface Pen. Sketch, write, and erase naturally with 1024 levels of pressure sensitivity; Surface Pen attaches magnetically for easy storage. Detachable PixelSense Display, with Pen & touch. The 13.5 inch PixelSense Display on Surface Book with Performance Base is simply beautiful, while working perfectly with Pen and touch. The 6 million pixels give you beautiful resolution and true-to-life color. Watch, draw, or design. Take the screen off, flip it around, and reattach it to watch a movie or fold it up to use it for drawing and design. Engineered for professional-grade software. Surface Book with Performance Base speeds through intensive professional software, like SolidWorks 3D CAD, AutoCAD Revit, and Adobe Premiere Pro. With the power to run these programs anywhere, you’re no longer chained to your desk. Windows Ink: Quickly turn your thoughts into action in Windows Ink workspace. You’re only a click away from the best inking features on your Surface like sticky notes, a blank page for sketching, or a quick screenshot that you can mark-up and share. Log-in with a smile: Log-in to your Surface with enterprise-grade facial recognition technology that can remember multiple faces, giving each member of your family access to their own profile. Cortana: Cortana is your truly personal digital assistant who works across all your devices to help you get things done. Cortana learns about you over time to become more useful every day. Always up-to-date security. Windows comes with the most comprehensive security features that stay up-to-date, protecting you from viruses and malware. The Surface Book with Windows 10 Anniversary Update version comes fully preinstalled with the latest updates, which includes Windows Ink, Windows Hellow, and comprehensive security. The ultimate laptop just got even more powerful. The latest member of the Surface Book family is built around a new, innovative Performance Base that delivers sharp, vibrant graphics and up to 16 hours of battery life. Testing consisted of full battery discharge during video playback. All settings were default (with base attached) except: Wi-Fi was associated with a network. Battery life varies significantly with settings, usage and other factors. Microsoft Surface Book with Performance Base from rondem on Vimeo. Surface Book has an internal fan for cooling. Surface book come with a mini display port. 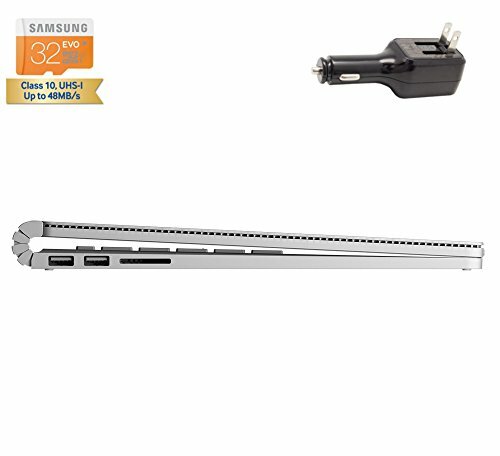 The Surface Book does not have a SIM card slot. Surface works with standard microSD card formats-microSD, microSDHC, and microSDXC. You can also use a full-size SD card with Surface Book. Any capacity will work. You will just need to purchase a European power adapter for the electric outlet. Surface Book can use 100-240V. You’ll just need a power adapter to plug it in. Microsoft Surface Book 2-in-1 Tablet-Laptop comes with Microsoft Windows 10 Pro operating system Intel 6th Generation Core i7-6500U 16GB LPDDR3 512GB Nvidia GeForce dGPU. 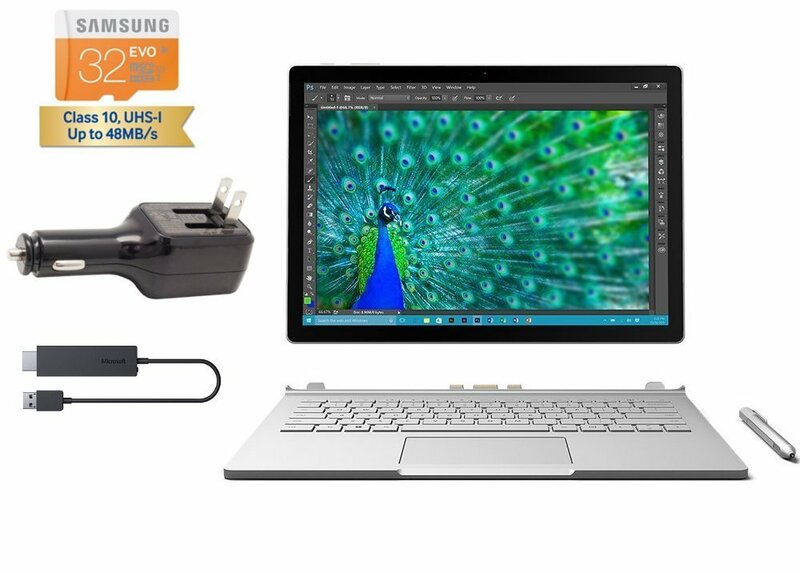 Microsoft Surface Book Convertible Tablet 2-in-1 Laptop: This ultrathin, high-performance Laptop is equipped with amazing 3000 x 2000 screen resolution & the versatility of a Tablet. 13.5 inch PixelSense display: 3000 x 2000 resolution for ultrarealistic detail, PixelSense technology, 267 ppi. Microsoft Surface Book Windows Tablet features a 6th Gen Intel Core i7-6500U mobile processor: Ultra-low-voltage platform. Dual-Core, four-way processing, the high-efficiency power to go. Intel Turbo Boost Technology offers dynamic extra power when you need it. 16GB system memory for advanced multitasking: Substantial high and width RAM to smoothly run your games, picture, video-editing apps, multiple programs and browser tabs all at once. 512GB solid-state drive (SSD): a flash-based has no moving mechanical parts, resulting in faster start-up times and data access, no noise, reduced heat production and power draw on the battery. NVIDIA GeForce dGPU To fast render high-quality images for videos and games. Extremely mobile at 3.48 pounds and measures 0.9 inches thin: Ultraportable design, offering a smaller screen size. 2-cell and 4-cell lithium-polymer batteries. Bluetooth interface syncs with compatible devices: Wirelessly transfer photos, music and other media between the laptop and your Bluetooth-enabled cell phone or MP3 player, or Bluetooth wireless accessories. 2 USB 3.0 Type A ports max the latest high-speed devices: USB 3.0 backward-compatible with USB 2.0 at 2.0 speeds. Built-in media reader for easy photo transfer: UHS-II SDXC memory card. Next-generation WiFi: Connect to a Wireless-AC router nearly 3x faster than Wireless-N.
5 MP front-facing and 8 MP rear-facing cameras with autofocus & dual digital microphones: simple to video chat with family and friends or teleconference. 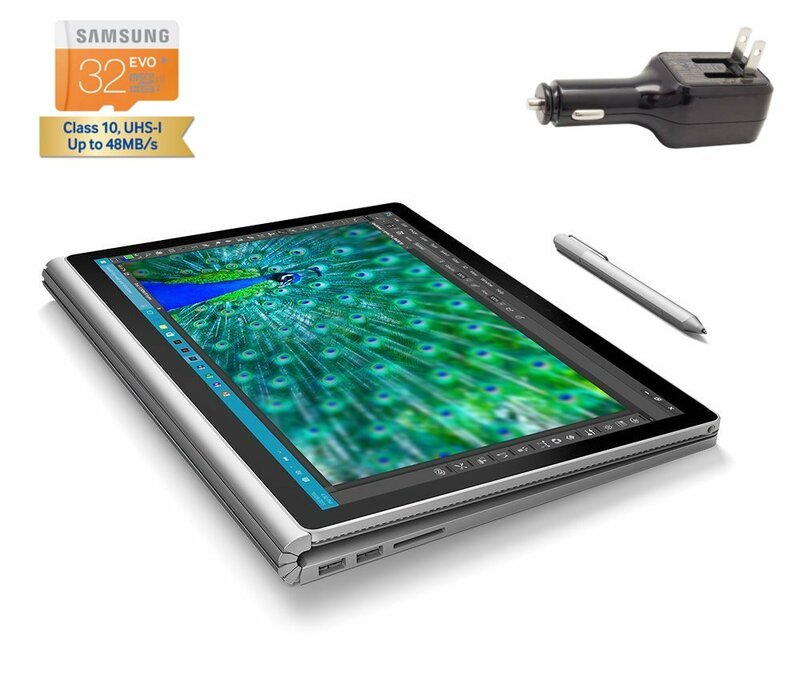 Display: 13.5-inch PixelSense touchscreen display (3000 x 2000) resolution n-trig digitizer screen with Surface pen stylus. Amazon.com Return Policy: You may return any new computer purchased from Amazon.com that is “dead on arrival,” arrives in damaged condition, or is still in unopened boxes, for a full refund within 30 days of purchase. Amazon.com reserves the right to test “dead on arrival” returns and impose a customer fee equal to 15 percent of the product sales price if the customer misrepresents the condition of the product. Any returned computer that is damaged through customer misuse is missing parts, or is in unsellable condition due to customer tampering will result in the customer being charged a higher restocking fee based on the condition of the product. Amazon.com will not accept returns of any desktop or notebook computer more than 30 days after you receive the shipment. New, used, and refurbished products purchased from Marketplace vendors are subject to the returns policy of the individual vendor.